We’ve all been there before: you get wrapped up with work or with kids and hours have passed since you've last had anything to eat. Before you know it you’re raiding the cabinets, eating whatever food is in front of you. Forget about carefully assessing what it is you’re in the mood for or preparing a meal or a snack and sitting down to enjoy it. When you are ravenously hungry, you may find yourself eating at a rapid pace, maybe even consuming food while standing up at the cabinet or refrigerator, eating directly out of a box, bag or container. When this happens, it’s common to overeat. When you learn to identify true hunger, eat to manage hunger levels, and honor your body when it is hungry, you’ll take in what your body needs, when it needs it and avoid possible excessive and erratic intake. Think about a time where you went out to dinner feeling ravenous. The bread basket calls your name, and you’ve filled up on rolls before you even order your meal. When you sit down to a meal, it’s good to feel hungry, but not to the point of being famished. Going to a table overly hungry will only increase the likelihood of overeating. One of the best ways to prevent this is to have a strong understanding of your body’s hunger and fullness cues, and then learning how to respect and honor them. 1. Identify foods that leave you feeling satisfied. Sweet? Salty? Crunchy? Savory? Cold? Hot? What is it that your body is seeking? 2. Differentiate between true physical hunger and an emotional desire to eat. Are you still feeling hungry after eating a balanced meal or snack? You may be eating out of an emotional response. 3. Learn when you're no longer truly hungry. Being able to feel truly satisfied with your intake, reaching a feeling of contentment is key. Keep a journal and note your hunger levels before and after your meal. Did the food satisfy you? Were you overly-full after eating it, or perhaps still hungry for more? How long did the food keep you full? Enter your email address to receive a FREE download of our Hunger/Fullness Scale including a Pre/Post Meal Challenge and Log Sheet. In this log you’ll receive in our free download, you may also identify how your environment influences what you eat, how fast you eat, and how much you eat. Do you eat differently while multi-tasking or watching TV? How about when you eat alone compared to when you eat with friends? Carbohydrates provide the preferred source of energy for the body, allowing it to work efficiently. Having protein and fats accompany carbohydrates slows the digestion of the snack. This will keep you fuller for longer, and also helps avoid any blood sugar spikes and crashes. Combining the three provides steady, reliable fuel that can keep you focused and energized. Need more help with this? Check out our Intuitive Eating Starter course for more guidance. Avocado toast: 1 slice of whole wheat bread toasted with sliced avocado. Sprinkle fresh pepper on top for a little added kick. Add some protein by adding a fried egg up a slice of tomato for some added antioxidants! Olive Tapenade: Add ½ cup of your favorite black and green pitted olives, ½ cup of roasted red pepper, and 1 clove of garlic to a food processor. Pulse a few times until roughly chopped. Now you have a healthy, savory spread for toast, veggie sticks or egg dishes. Impress your friends at the next wine and cheese party with this tapenade! Chia pudding/Overnight oatmeal: Mix 2 cups of milk or non-dairy beverage (Almond milk, soy milk, etc.) ½ cup of chia seeds, a dash of vanilla extract and maple syrup. Let sit overnight, the chia absorbs moisture from the milk and forms a tapioca-like texture and ¡Voila! You now have a nutrient packed pudding. Substitute oats for the chia and you have overnight oatmeal. Add berries for an extra antioxidant punch and/or chocolate chips and shredded coconut flakes if you are seeking something a bit more savory. Build your own trail mix: Add equal parts of assorted dried fruit, nuts and whole grain cereal, chocolate chips for a fuel packed snack! Smoothie for one: Add handful of greens, ½ banana, handful of berries, 1 cup of almond milk to blender. Blend until well mixed. Switch the fruit or add avocado for a twist. Enjoy! Banana Roll Ups: Spread thin layer of peanut or other nut butter on a slice of whole grain bread or wrap and top with sliced banana. Roll up and enjoy. This simple recipe sounds crazy, but it’s just as easy as it is delicious, we promise! Add a sprinkle of pomegranate seeds for a juicy punch or some dark chocolate shavings if you’re seeking something a bit more sweet. Yogurt Bowl: Vanilla Greek yogurt swirled with peanut butter and topped with chopped strawberries and chocolate chips. Sweet and savory! Step 3: Pay extra attention to hunger and fullness sensation. Stay present. 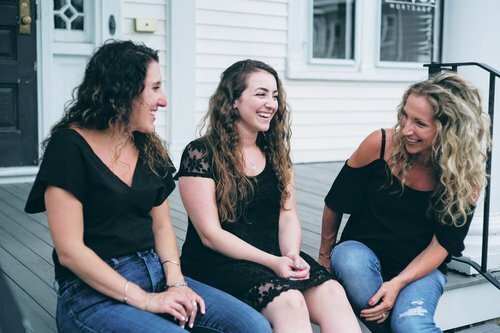 Tuning into the eating experience and tuning out all extraneous distractions will help you connect to these signals your body is sending you. Keep your food journal sheet handy and note your hunger, as explained above. If you haven't already done so, download the hunger and fullness gage and a log sheet we created for you to use HERE. Avoid feeling rushed or distracted while you eat. This will allow you to be more in tune with how you’re feeling. Take your time to hone into the sensory experience of food intake. See our step-by-step guide to tuning into your senses in our Break up with dieting and Heal your Relationship with Food post. When was the last time I ate? Was it a long time ago? Was my meal balanced with carbohydrates, protein, and fat? Was I satisfied with what I ate after I ate it? Am I really hungry, or do I want to eat out of habit? Take a minute to breathe. Sometimes we get so caught up in what is going on around us that we lose sight of our actual appetite signals. Ditch the diet principles. You can’t listen to the signals your body is sending you if you are always focusing on exact portion sizes or calorie amounts to determine what and how much you eat. Avoid being distracted or rushed when eating. Taking a relaxed approach allows your body time to communicate with your brain’s feelings of satiety. With your food journal at hand, ask yourself the questions mentioned above about the types of food you ate, and your timing of meals and snacks. Assess how the foods you ate satisfied your hunger and made you feel. The more you log, the more accurate you can learn what works best for you. Why should we tune into what our body is truly hungry for? Not listening to internal hunger creates a disconnect between you and your body. We need to work towards being one with your body instead of fighting against it. Tuning in and understanding what true hunger feels like can be challenging! If you’ve been caught up in a nasty cycle of dieting, you’ve likely suppressed these natural signals which can make it even harder for you to start feeling them again. Sometimes we think we’re still hungry when we’re really just not satisfied with our intake. Say you’re craving something salty and crunchy after lunch, for instance, but you choose to eat an orange instead of having chips. As a result, you may be left feeling unfulfilled or unsatisfied, which can then lead to you overeating when you do eventually give into what it is your body is telling you it needs. 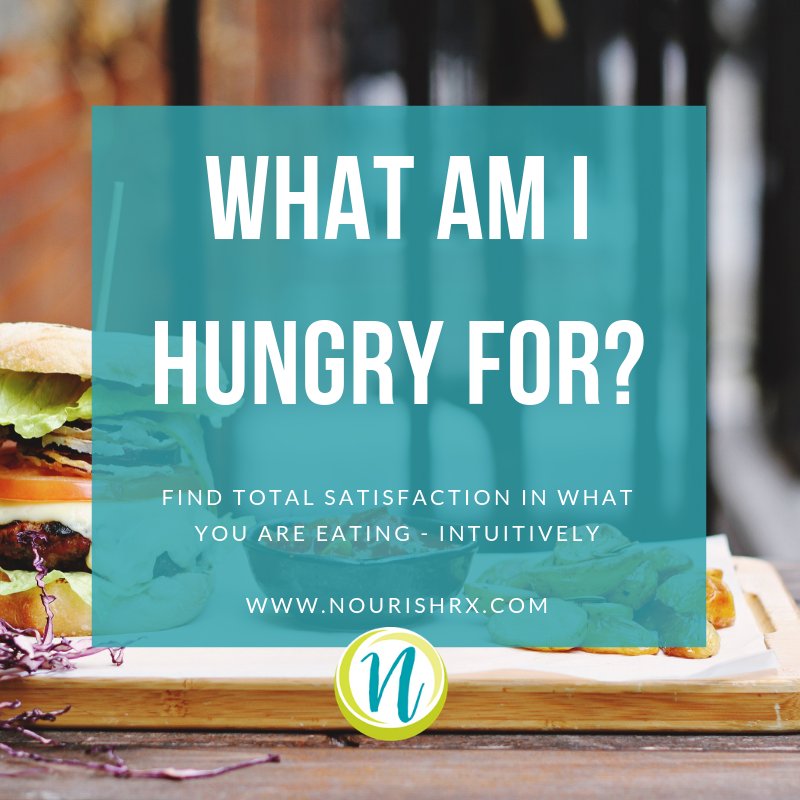 If you find that you’re not truly satisfied with your intake, you may be missing out on the “satisfaction factor,” which is an essential piece causing this hunger that makes up the fullness equation! If you find that you’re never full after eating, this could be due to eating out of emotional hunger rather than physical hunger. Start by slowing down, tuning in and connecting the dots with your intake and mood. This should give you a better understanding of what is driving your need for food. Thinking you SHOULD be satisfied with your intake is a heck of a lot different than truly being satisfied with your intake. Make sure that what you are choosing is leaving you full, satisfied and not wondering when your next meal or snack will be coming. Comment below if you’ve tried out any of these methods or recipes, and let us know what you think!